← Record heat in LA, global weirding! Posted on November 9, 2010	by Lou Murray, Ph.D. I do indeed have a harvest to report this week, despite the record-breaking heat wave last week. The temperatures at John Wayne Airport here in Orange County, CA reported 100 degrees F on both Wednesday and Thursday. No wonder it seemed hot! On Harvest Mondays, gardeners report what they harvested or what they used from their stored harvests. I’m pleased to report that we ate some of my homemade dill pickles last week. It was too hot to cook, so I just nuked some Hebrew National knockwurst, sliced the sausages, and put them on toast along with mustard and my homemade pickles. Yummy. I still have onions and garlic from earlier harvests to use in my fall cooking. Last night, we had a dinner of beef stew. I used grass-fed beef, raised with no hormones, no antibiotics, and never in a feedlot. Ah, but the beef came from Australia, so I get points subtracted for not eating locally. A lot of fossil fuel got burned bringing that beef to my kitchen. I hope it was less than the fossil fuel that is needed to raise corn and soybeans to feed cattle in a feedlot. I know, a vegetarian meal would have been even more environmentally sound, but we do eat meat once in a while. Nothing like a bowl of homemade beef stew on a cold autumn evening. If you’re like me, you make these things up as you go along. In case you’re interested, here is the recipe. Dredge the beef chunks in flour with salt, pepper and thyme added to taste. Brown the beef chucks in bacon grease in a large stock pot. Add the onions and garlic and continue to brown. Add liquid and tomatoes, cover, and cook for one hour before adding vegetables. Add the vegetables in the order given, slicing up each new vegetable as the last one was added. While the vegetables are cooking, cook the barley in water for 45 minutes. Add cooked barley to stew and cook another 15 minutes. Serve with a good bread and a fruit dessert. My collard greens and the last of our green beans went into this stew, along with homegrown tomatoes and the onions and garlic. Here is our harvest for the week ending November 7, 2010. If you’d like to see what other people around the country are harvesting this week, visit Daphne’s Dandelions. 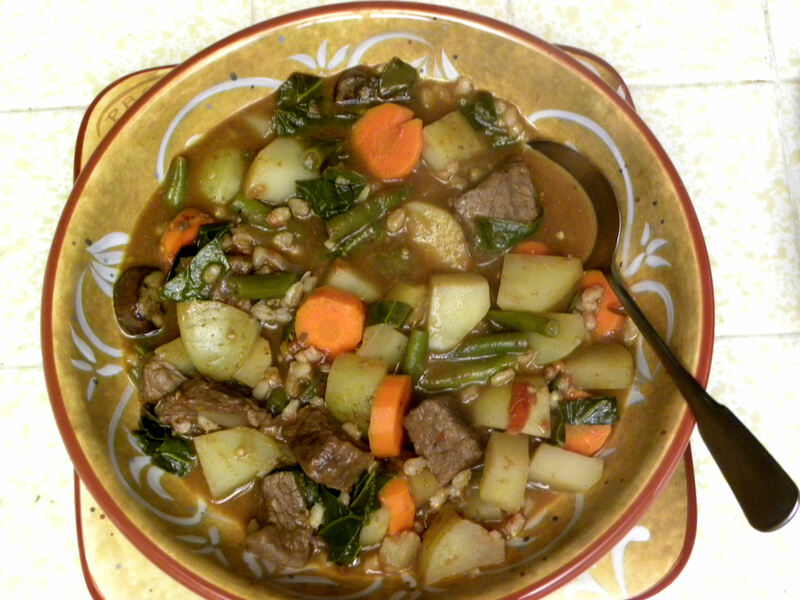 This entry was posted in Uncategorized and tagged barley, beef stew, collard greens, Harvest Monday, recipe, vegetable garden. Bookmark the permalink. 100 degrees!!! We are freezing out here in PA! Those onions are beautiful! My onions were a complete failure this year. It was the first and last time I will sow them from seed. Robin, I have great luck with green onions and leeks from seed. Not so much bulb onions. I use sets for bulb onions mostly. Those are good looking onions. I can’t seem to grow bulb onions to save my life! I haven’t tried to grow garlic yet. I really like it, so I guess I should try to grow it. Any tips on growing garlic OR onions that bulb up? Veggie PAK, I garden in southern California, so I plant onion sets in the fall that our local nursery sells for our region. 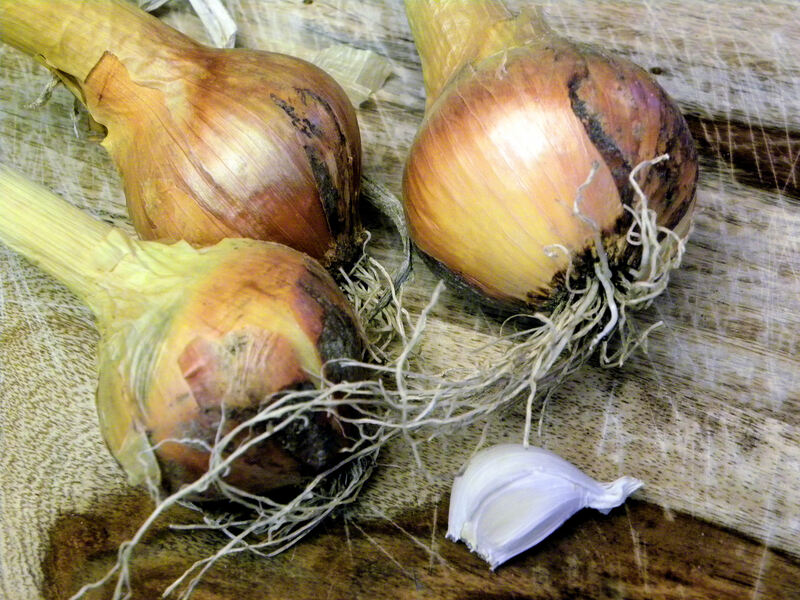 Onions are sensitive to day length with some being spring onions and some fall onions. That’s too confusing for me, so I just trust our nursery to sell the right thing at the right time. Two years ago I had nice big onion bulbs, but this year the bulbs are mediocre. Go figure. Good luck with yours. Well, thankfully we weren’t that hot. It was warm for November here, but only in the mid-80s. Your beef stew looks so tasty! I made a beef stew a few weeks ago with barley, and butternut squash. Never had butternut in my beef stew before, but it went surprisingly well with the beef . Next time I’ll have to try adding collards instead! Clare, I found a recipe from Australia that called for Queensland Blue winter squash and kangaroo. I substituted bison and it turned out great. If I ever grow a Queensland Blue, I’ll try it with beef. KitsapFG, barley goes really well in beef stew. The addition of grain helps us stretch the beef. As noted above (or below, who knows? ), the weather was at 100 degrees for only two days, and had cooled off by the time I made stew. That beef stew had me drooling, but I don’t envy the 100 temp, please tell me it cools down, way way lower than 100 because I’m going to OC coming Thursday. Mac, I assume that you had good weather for your visit. The low last night was in the low 40s, so it has cooled down a LOT. Oh how can you cook stew in that weather? Now my weather is stew weather. Yesterday they were predicting sleet, but I never saw any. It was just really, really cold rain. Brrrrr. If we averaged our temperatures out we both would have had a nice day. BTW beef stew is one of my favorites. I tend to use left over beef from roast beef in mine. Most of the beef we eat is grass fed local beef. But those roasts are harder as the place I buy from doesn’t sell roasts. Daphne, you’re lucky to have locally grown grassfed beef. BTW, the weather had cooled back down by the time I cooked the stew. Congratulations on your continuing harvest. At least the tomatoes must love the ongoing high temps. I also love putting barley in soups and stews. Both your dishes – the stew and the knockwurst with pickles – sound delicious. mmmm that stew looks amazing!